AKA Daniel Michael DeVito Jr.
Danny DeVito is a short, usually comedic, actor and filmmaker. In his most famous role, he played Louie De Palma, the unscrupulous and somewhat slithery dispatcher on the sitcom Taxi. As director, his resume includes Throw Momma from the Train and The War of the Roses, and as producer his films include Get Shorty, Out of Sight, and Erin Brockovich. DeVito's father was a small businessman whose endeavors rarely prospered. 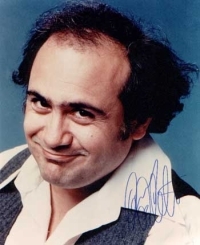 Before deciding to become an actor, DeVito worked as a licensed hair stylist in his sister's salon. He studied at New York's American Academy of Dramatic Arts, and made his New York stage debut in 1969, opposite Bert Convy in Shoot Anything With Hair That Moves. Working in summer stock in Connecticut, he met and befriended the young Michael Douglas. DeVito was soon subletting Douglas's Manhattan apartment, and when he met another aspiring actress named Rhea Perlman, she moved in two weeks later. DeVito played Martini in an off-Broadway production of One Flew Over the Cuckoo's Nest, with William Devane as McMurphy. Five years later Douglas produced a film version of the play, starring Jack Nicholson, and gave DeVito his first screen role, reprising Martini. His other films include Terms of Endearment with Shirley MacLaine and Debra Winger, Romancing the Stone with Kathleen Turner and old chum Douglas, and Twins with Arnold Schwarzenegger. His first feature, Throw Momma from the Train, was an acerbic, uncredited remake of Hitchcock's Strangers on a Train, and his The War of the Roses with Douglas and Turner challenged Hollywood expectations of a happy ending. In the underrated Death to Smoochy, a dark satirical spin on the Pee-wee Herman scandal, Robin Williams played a disgraced clown seeking vengeance on the titular fuchsia rhino, played by Edward Norton. With Perlman, DeVito founded Jersey Films, an independent studio which produced Reality Bites and Pulp Fiction, and the silly cop sitcom Reno 911! Perlman and DeVito co-wrote the 1975 short, Minestrone, in which DeVito discovered a tiny scuba diver in his soup. They have worked together often, in Taxi, and in films from Swap Meet to The Ratings Game to Roald Dahl's Matilda. In 2005, DeVito and Perlman were sued by Ivan Harnden, a guest at their 2003 New Years Eve party. He alleged that DeVito and Perlman "had a duty to exercise due care in operating and managing the party and the dance floor," and that they were thus liable for injuries Harnden received when a drunken partygoer smashed a champagne glass into his face during the festivities. "It's a frivolous lawsuit," said DeVito's lawyer. "The last time I checked drinks do spill."